Mom Knows Best : Save $1 when you buy any WinCo Pizza and Coca-Cola Beverages! 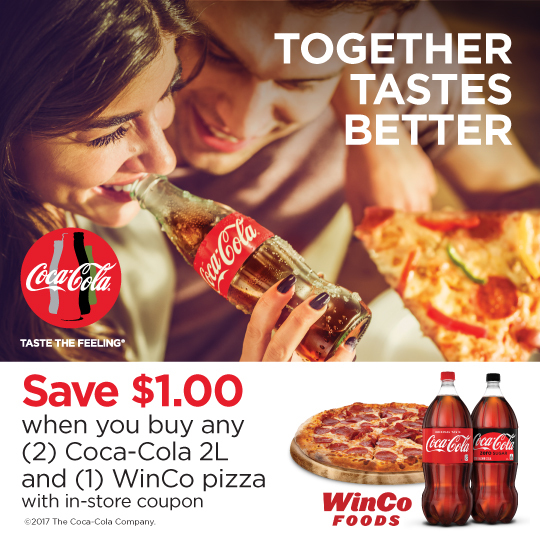 Save $1 when you buy any WinCo Pizza and Coca-Cola Beverages! Make a meal worth savoring this holiday season! Enjoy the refreshing taste of Coca-Cola® wherever your tastes buds take you. The pairings are endless. Pineapple? Pepperoni? No matter how you slice it, pizza tastes better with Coca-Cola. Discover products you love at amazing low prices when you shop at WinCo! Pick up 2-Liter Coca-Cola beverages and WinCo Pizza (take and bake or oven fresh) this holiday season for an easy holiday meal solution. Save time preparing your holiday family meal, so that you can enjoy more family time - holiday crafting or movie nights!